Gather ’round kids and I’ll tell you a story of how old timers used to make pictures back in the olden days. As an illustrator, you have to be ready and able to draw anything a client might ask for, so photo reference is a must. In pre-internet days, artists were continually begging people to give them their old magazines. They would then spend hours looking through them, ripping pictures out and organizing them into file folders. By saving various pictures of random things, there was a slight chance that when a future client asked you to draw some obscure subject, you might actually get lucky and magically find a picture of it in your files. The more expansive your “clip file” was, the greater chance you had of finding usable reference in it. Not exactly an ideal system but better than nothing… slightly. Finding reference material is so much easier today. The last magazine job I did was a story about a guy finding Elvis’s rusty old motorcycle in a garage sale. 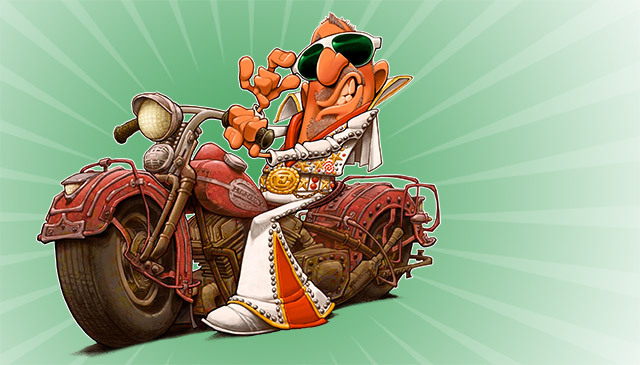 The client wanted a caricature of the writer dressed as Elvis and sitting on the motorcycle. I jumped onto the internet, googled up a motorcycle and an Elvis costume and within minutes was working my drawing out. The good old days were good old days, but I’m a pretty big fan of new technology. These days if a client calls and wants a picture of a Gobi Jerboa, I can quickly look it up, read all about it, find a dozen good pictures to work from and draw a Gobi Jerboa that actually looks like a Gobi Jerboa. Wella hey Man,,,, th that’s cool! What a hoot… I have been doing the same thing for years, collecting pages from magazines ect. Mine aren’t as organized as yours and I haven’t been blessed with your talent, but I love all your work. It’s fantastic !! !